The full name of Chris Gayle is Christopher Henry "Chris" Gayle. Gayle was born in the year 1979 September 21st at Kingston, Jamaica. Gayle is a Jamaican cricketer and in International level, Gayle plays for West Indies. Gayle is famous for Powerful hitter of the ball. He scores most of the runs in sixes. Gayle is a left handed attacking batsman and a right handed off spinner. Gayle also played for Worcestershire, the Western Warriors and the Kolkata Knight Riders. His current IPL team was Royal challengers Bangalore. Gayle also became the captain of West Indies from 2007 to 2010. Gayle was a T20 specialist. 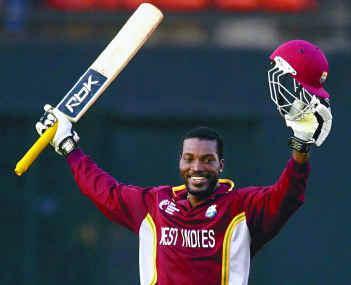 Gayle was the first person to hit a century on T20 International cricket. Gayle started his test career in the year 2000 March 16 against Zimbabwe and he made his ODI debut in the year 1999 September 11.
west indies loss is 'RCB' gain. I have been one of the witnesses of 'CHRISSSSSSS GAYLE 's exploits with the bat last year and this year and honestly i have never seen like that before.What striking power !mind boggling.He IS NOT not a' flash in the pan' cricketer ,he know his strengths more than a bowler knows about his weaknesses. Thanks to Mr Vijay Mallya for bringing Chris Gayle to RCB and Bangalore.